Have you found what looks like a flying ant in your home? Do you have a “swarm” of what looks like ants with wings? Have you ever had your home inspected by a certified termite technician? Often in early spring customers would call requesting a price quote to “spray for flying ants” or “ants with wings.” After thorough inspection and identification from one of our certified pest control technicians we find that the flying ant or ant with wings is a termite infestation. At certain times of the year and when conditions are right, flying termites or termite swarmers (called alates) will take their nuptial flight. Often mistaken for flying ants, termite swarmers or winged termites are part of the reproductive caste of the colony. Male and female reproductive swarmers usually emerge in spring, although termite swarmers may emerge almost anytime during the year. In Delaware and Maryland swarms occur most often when the temperatures are hot and humidity is high. After a short flight, which may only last a few minutes, the male termite swarmer and female termite swarmer court and strive to establish a new colony. When the nuptial flight is over the termite male and female swarmer lose their wings naturally. 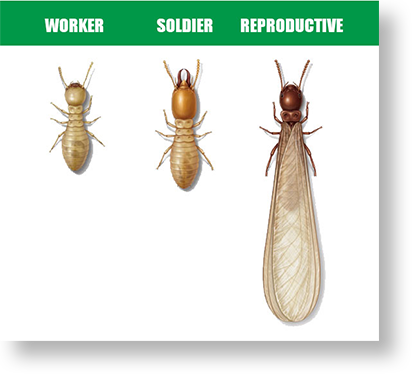 The female termite releases a sexual attractant pheromone which the male gladly chases in a tandem behavior. After the short nuptial flight the pair seek a suitable moist wood to ground contact location to start a new colony. Termite swarms are often a home owner’s first visible sign that they are in need of a termite inspection to evaluate the extent of a termite infestation. Termite swarms usually occur during the day. Contrary to some bug guys or termite exterminators, not all termite swarms are an indication that you have a termite infestation within the structure. In many cases we find that the termite swarm has originated from an outdoor termite nest located in the yard and away from structure. However since termite swarmers or winged termites are attracted to light, evidence of broken termite wings around windows and doors are a good sign that the swarm has emerged from within the structure. A word of caution, to the untrained eye a “flying ant” looks much like a swarmer termite. Unfortunately customers have experienced immoral bug guys or termite exterminators who misidentify due to lack of knowledge or with mal-intent. It is important to know how to identify the difference between a Flying Ant and a Termite Swarmer. It is our policy to provide each customer with a Free On-site Thorough Inspection by a Full Time Certified Pest Control Professional Technician. We will complete a thorough inspection of all the accessible visible areas of the home or structure, determine whether or not termites are actually present, note any conducive conditions that may contribute to an termite infestation, gather structural awareness or construction variable data and provide you with a solution to treat and eliminate your home of termites.